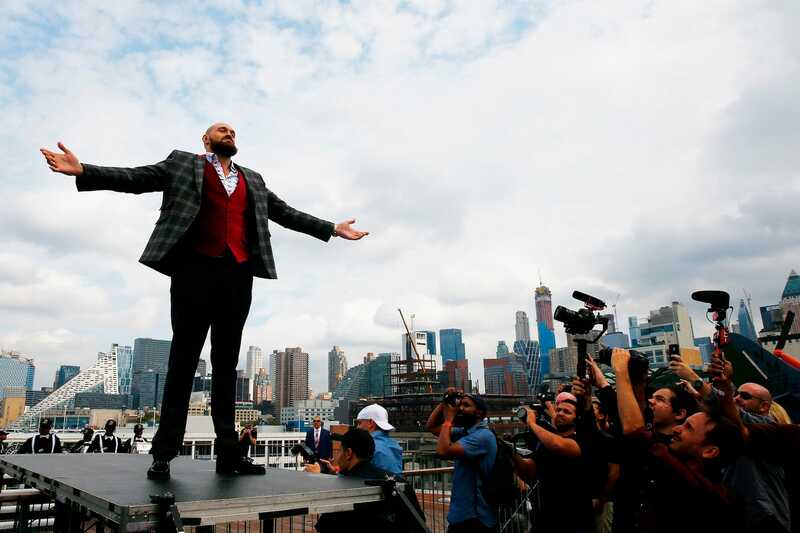 Photo by Mike Stobe/Getty ImagesTyson Fury will fight Deontay Wilder on December 1. Tyson Fury opened up about his experience with depression on Joe Rogan’s popular MMA Show podcast. Fury was on top of the boxing world when he stunned Wladimir Klitschko with a punch-perfect performance to win three of boxing’s four major championship titles in 2015. But that massive high led to a massive low. Fury turned to drink, drugs, and even tried to commit suicide, he said. But a voice told him not to, he pulled over, was “frightened and afraid,” and sought psychological help. He is now on the comeback trail and is looking to win a world heavyweight title once again, when he challenges Deontay Wilder for the WBC belt on December 1. Tyson Fury has said he “suffered with mental health problems” all his life, but was only able to understand it after he became boxing’s heavyweight champion of the world. Fury, an unbeaten fighter, stunned the boxing industry when he outclassed long-reigning heavyweight king Wladimir Klitschko in a 2015 fight in Düsseldorf, Germany. The victory was resounding as Fury’s awkward style – rangy and long, with an accurate shot selection from unconventional angles – bamboozled Klitschko, and inflicted the Ukrainian’s first defeat in 11 years. The win completed Fury’s life’s work, he said. As an amateur fighter, he used to study Klitschko and always dreamed of beating him and becoming boxing’s new ruler. “When I beat him, I didn’t have anything more to prove,” Fury told Joe Rogan on the popular MMA Show podcast. Fury claims boxing politics stripped him of the championship belts he legitimately won in the ring. He then said he turned to substances. “I hit the drink, heavily, on a daily basis. I hit the drugs. I was out all night partying with women of the night and not coming home. I didn’t care about boxing, about living, I just wanted to die. I was going to have a good time doing it while I was doing it. Seeking psychological help and having his father, John Fury, move in with him, his wife, and children, helped Fury take the first steps toward his comeback in sports. He had tried other hobbies, but there was a void in his life that could be filled with one thing and one thing only – boxing. Fury returned to the boxing ring in 2018, over 30 months after he had toppled Klitschko. He stopped the low-ranked fighter Sefer Seferi in the fourth round in Manchester in June, before defeating Francesco Pianeta on points two months later. He is now looking to win a heavyweight world title, for the second time in his life, as he challenges the big-punching American fighter Deontay Wilder for the WBC belt at the Staples Center in Los Angeles on December 1. Wilder’s power means he is a fighter many might fear, but judging by the way Fury tells it, he has already won the fight of his life.